Stranded at Teterboro: Part II…”The Rescue Misson!” – EHFC Members Talking! On Saturday the 24th, while Thomas was traveling back to Ithaca on the bus, I was eating Thanksgiving leftovers and thinking about my upcoming Sunday IFR lesson. I was scheduled to fly with David (St George) on a cross-country to Syracuse and Oswego. From the East Hill Facebook page, I learned of Thomas’ adventure and of a planned Sunday “rescue mission” to Teterboro. From the weather forecasts, I learned that lake effect snow was expected in Syracuse on Sunday, making a northbound cross-country somewhat unlikely. Upon discussion with David, we decided to combine my cross-country lesson and the rescue mission and fly to Teterboro instead of Syracuse. I was thrilled, since I really wanted to get some experience in the busy NYC IFR environment. I had been in NYC airspace once before, on a solo VFR Hudson Corridor trip, so I already knew there is no substitute for that airspace if you want to challenge yourself as a pilot and take your skills to the next level. On Sunday morning, Thomas, David and I met at the club and decided on the plan. The weather was not ideal, but acceptable. There was an overcast over Ithaca that extended somewhat futher southeast, but the NYC area was clear. Icing would be a possibility and definitely something to watch for on climbout, but we made the collective judgment call to give it a try, while being very vigilant and ready to divert to Binghamton at any sign of trouble. We took with us the tire and tube for the Mooney, Thomas came along to fly the Mooney back, and David Wanagel came along to help as well. The plane we would be taking was 97266, as it was still in engine break-in and needed to go on more trips. This would pose a challenge for me as I had hardly flown that plane at all; as most of you know, unlike our other two 172’s, it is equipped with an Aspen “glass” display which looks quite different from the traditional instruments that I am accustomed to. Still, I was up for the challenge and we set off for Teterboro. We filed KITH-HNK-V167-WEARD-V489-COATE-KTEB and received an “as filed” clearance. So far so good. After takeoff, icing was not as big an issue as we had feared, so we continued on past Binghamton. I was having to work very hard to understand the display on the Aspen, and many of the fancy features were confusing me greatly; however, I gradually got used to it. The flight was uneventful until we got close to the city and switched to New York Approach. As you know if you’ve flown that airspace, there’s always a moment where things go from “sleepy and quiet” to “OMGWTFBBQ there are HOW many planes around me and on the frequency?”. That definitely happened, and I had a hard time maintaining situational awareness given that I was also dealing with an unfamiliar plane. 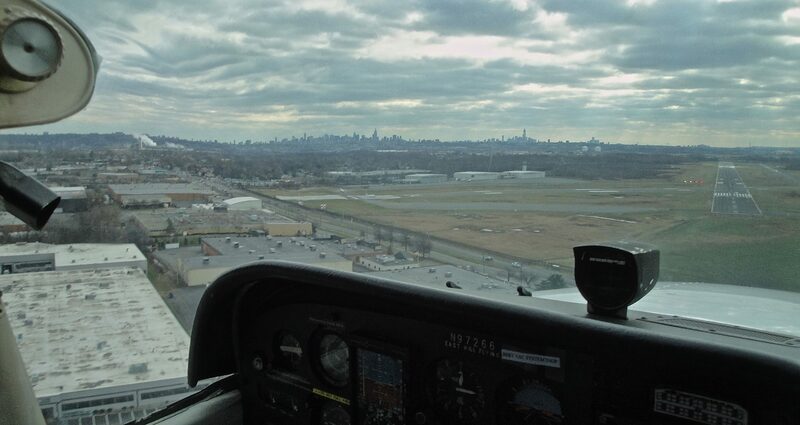 With David there to help, however, things went reasonably smoothly and soon we were descending — through a thin layer of clouds, picking up just a trace of ice — and tracking the localizer and glideslope inbound for the ILS 19 approach into Teterboro. The wind situation was less than ideal, with winds reported at 330-ish at 10+ knots with gusts, setting us up for an unpleasant downwind landing. We were considering asking for a different runway, but as we were coming in to land, the wind had shifted to a right crosswind, which we could work with. The photo you see was taken on short final; I have only the faintest recollection of David taking it, I was so overloaded. Once safely on the ground, we had a minor misunderstanding with the Tower controller as to the taxiway we should pull off on, but this was quickly resolved (with traffic behind us, there was no time to resolve it slowly!). 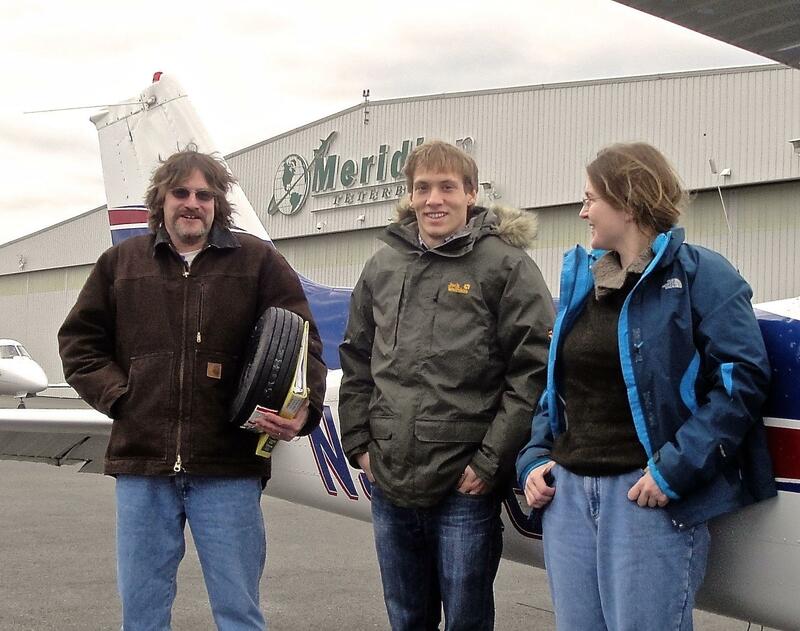 At Meridian, we delivered the tire and met with Eric, the mechanic who would install it on the Mooney. In the meantime, we borrowed one of the crew cars and went to have lunch at Panera Bread. Once back from lunch, with the Mooney fixed and ready to go, we needed to get back to Ithaca. Thomas and David Wanagel would return in the Mooney, whereas David St George and I would take 266. With 30+ knot headwinds along our route and the challenges of IFR routing out of Teterboro, we readied ourselves for a long trip. ATC making us take the long way home! 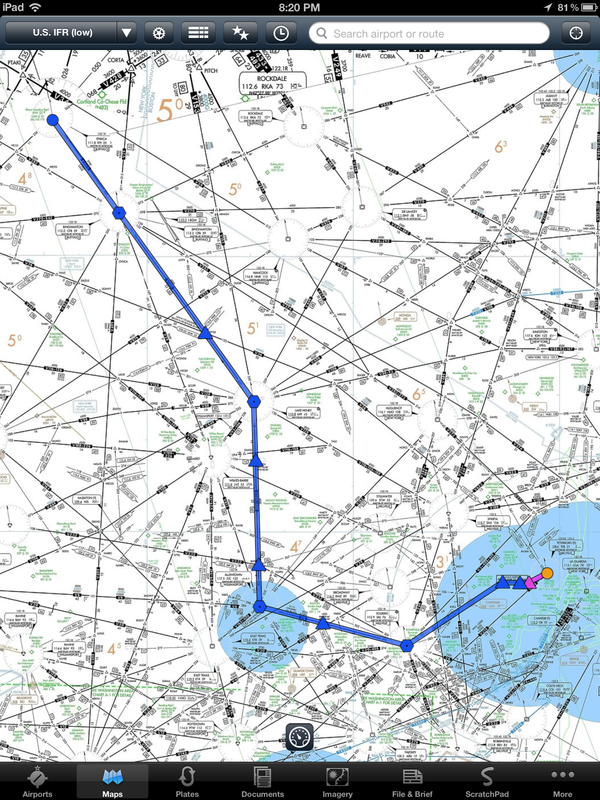 I forget which route we filed out of Teterboro, but that turned out to be highly irrelevant as ATC had other plans for us. The clearance I received is shown on the photo you see, and it is KTEB RUUDY4 SBJ V6 FJC V149 CFB KITH. Less than ideal, but hey, at least it included a “real” departure procedure (you don’t get exposed to those much flying around Elmira and Syracuse :-)). Plus I got good practice copying down and reading back a “real” clearance. Then we had to get permission to taxi, which proved harder than anticipated. It was now about 3pm on the Sunday after Thanksgiving, and the concentration of assorted Citations, Gulfstreams and Learjets on the airport was very high. We waited a good 20 minutes before we got cleared to taxi, and then spent some more time waiting in the runup area between runways 19 and 24. The airport was insanely busy, with traffic constantly landing on 19 and taking off on 24. We took off and followed the RUUDY FOUR departure procedure to the letter, with various Newark-bound jets zipping around surprisingly close to us. Then things became logistically simple if rather slow; our routing took us very far west before we could turn back north. We requested shortcuts several times (another thing you don’t get to practice with Elmira Approach! ), but the airspace was busy and the controllers could not do much for us. We did eventually get “direct Ithaca”, but were pretty much over Wilkes-Barre by then already. At about 16:30, the Sun set over the clouds, and then it was night. After Wilkes-Barre, we were in and out of IMC, it was snowing lightly, and the plane slowly began to pick up rime ice. There was now virtually no-one else on the frequency, it was very dark and somewhat uncomfortably cold, even with the cabin heat on. I took the hood off since there was nothing to see outside anyway. Occasionally we would see a few lights on the ground, then it would be completely dark again. After the intensity of the New York City airspace and all the excitement of the day, the silence and darkness felt pretty strange. As has been pointed out by better writers than me (notably Saint-Exupéry in “Night Flight” and William Langewiesche in “Aloft”, both books you should read if you haven’t already), there is something singularly isolating about flying on a dark night. I forced myself to focus on the mission of getting home. Fortunately, reality intervened before I could get too meditative. The microphone on my headset, which had been giving me minor trouble for a while, decided to malfunction seriously (of *course* it had to happen at night, in IMC, with ice on the plane…). I wasn’t scared, but I was certainly glad that David was there and that his headset was working fine. Finally — we still had a bad headwind, so it was slow going — we landed in Ithaca around 6pm. We flew the familiar ILS 32 approach and made it home. The total time on 266, including ground delay time in Teterboro, was 5 hours. Meanwhile, Thomas and David Wanagel made it back in the Mooney safely and much earlier than us, after — to my understanding — an uneventful flight with little or no icing trouble. All in all, it was an amazing trip and a great learning opportunity. I certainly plan to fly frequently in busy airspace once I have my instrument rating, so this was invaluable training for me. At this point, I am confident that when I go into New York City airspace IFR on my own, I will be able to handle it. It will still be a challenge, to be sure, but now I know I can do it. And hey, as a bonus, we got the Mooney back, so all’s well that ends well. Thanks to everyone involved in this great adventure!